The second season of the brand’s classics series is here. 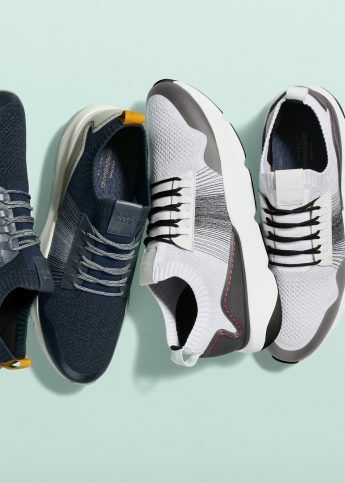 Just announced this week, the second season of Chicago founded-Greenland based men’s footwear label Cole Haan’s GrandPrø range is ready to drop. An innovative reinterpretation of contemporary and classic silhouettes, as we speak the line-up is making waves in the mens footwear departments of Selfridges and Liberty. Available in a diverse range of colour ways, the collection features three styles: embodying an athletic vintage style, on offer is the Tennis Sneaker, a traditional court shoe, and it’s partner, the Running Sneaker, an old-school classic with gripped rubber soles. Accompanying them elsewhere is the Short Wingtip Oxford, a traditional Brogue style with added dual-density cushioning in the form of a wide set sole, offering comfort without sacrificing style. So there’s pretty much, give or take, something for everyone.